ChiIL Live Shows: Cirque du Soleil Quidam's Publicist, Jessica-Video Interview With ChiIL Mama & Free Quidam Tickets! Cirque du Soleil Quidam's Publicist, Jessica-Video Interview With ChiIL Mama & Free Quidam Tickets! It was our great pleasure to interview Jessica, Publicist for Cirque du Soleil's Quidam. 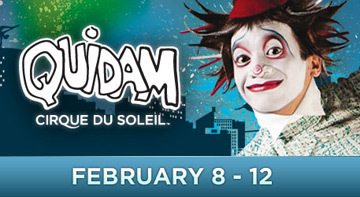 Quidam is returning to play Hoffman Estates near Chicago February 8-12th only! Jessica tells us about the arena Cirqe shows versus the big top style, how Quidam is family friendly but also great "boyfriend points", and how they get in and out of town "rock and roll" style. Check it out here in our original interview. **Don't forget to click this link and enter for your shot at 4 free tickets to Quidam! Entries accepted through midnight 2/2/12. Good for the opening night performance, February 8th at 7:30pm. Enter through Thursday 2/2 at midnight.